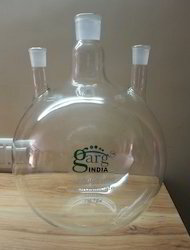 We offer Flat Bottom Glass Flask.made from fine quality borosilicate glass in all sizes from 10 ml 10 000 mls. All flasks withstand high temperature and are Autoclave able. 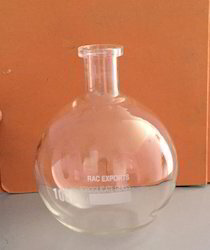 Owing to the presence of our expert team members, we have been able to offer a wide range of Flat Bottom Flask. These are manufactured using top quality components and using best available technologies. Owing to its rugged construction and effective performance, these flasks are extensively recommended by various numbers of clients. These are available at reasonable rates. We provide Flat Bottom Flask that is exclusively demanded in laboratories for the instrumentation for vapors and gases. Moreover, our Flat Bottom Flasks are also used for measuring liquids and collecting and mingling from the apparatus like distillation setup, etc. Our Flat Bottom Flask has robust construction owing to which it can easily stand alone. Duro Lab Glass Manufacturing Co.
Flask flat bottom vial mouth neck made in soda, neutral and borosilicate glass. Capacity: - 100, 150, 250, 500, 1000 ml. With our in-depth knowledge and experience in this industry, we are one of the leading manufacturers, suppliers and trader of Flask - Flat Bottom Flask. Our offered products are thoroughly checked on various parameters to deliver a flawless range. We offer this product at competitive price to our valuable clients.